EasyAutoTagging is a simple to use tool that automates generating Facebook Ad URL Parameters for granular campaign tagging and imports Facebook campaign cost, impression and click data into Google Analytics in a few simple steps. Once you connect your Facebook Ad Account and EasyAutoTagging continuously scans for new Facebook Ads automatically pushing URL Parameters to the tracking field. 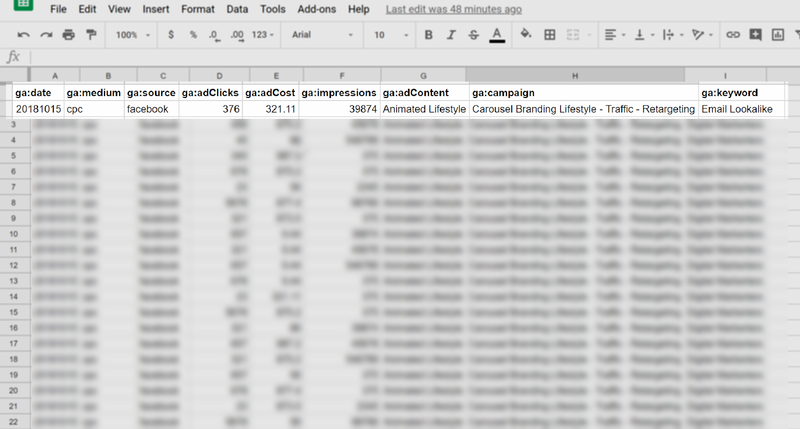 With import cost data enabled EasyAutoTagging performs a daily upload of Facebook campaign cost, impressions, and click data using the same parameter values pushed to the tracking field. By leveraging EasyAutoTagging to automate the tagging and import processes, you can focus on analyzing granular blended session and cost data using the Google Analytics custom, e-commerce and cost analysis reports. To maximize the benefit of EasyAutoTagging across multiple clients, Facebook and Google Analytics accounts, and a sizable number of campaigns it is important to have a thought out and defined naming and tracking structure in place. If you are an agency or a consultant with multiple clients, there is a good chance a naming and tracking structure is already in place. EasyAutoTagging is built to be flexible so that you can integrate its automation benefits into your existing workflow. Parameters should be clearly defined at the onset of a campaign since you cannot retroactively change session dimension values in Google Analytics.